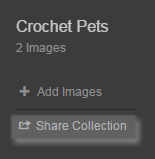 Select the collection that you want to share or create a new collection, as described in Creating and editing image collections. Click Copy to Clipboard to copy a link to your new collection. Paste the link into any Jive content to share your new collection. Remember: If you share your collection with community members who do not have view permissions to the place you shared your collection from, they are not able to view the collection.